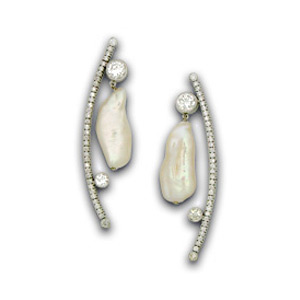 Handmade 14K white gold one of a kind diamond and cultured pearl earrings. Total diamond weight approximately 4.50 ct. DP4.50 – Call for pricing. 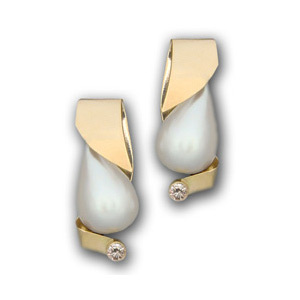 Handmade one of a kind geometric styled 14K yellow gold, diamond and mabe cultured pearl drop earrings. Total diamond weight approximately .80 ct. GPD.80 – Call for pricing. Click to see our jewelry at the 2015 Emmy Awards! Click to see our jewelry at the 2015 Screen Actors Guild Awards! Home | The Franklins in Gold™ | Diamond Vine Collection™ | Other Collections | Emmy Awards | Screen Actors Guild Awards | Academy Awards | Press Room | Contact | © Copyright 2017, Susan Eisen, Inc.